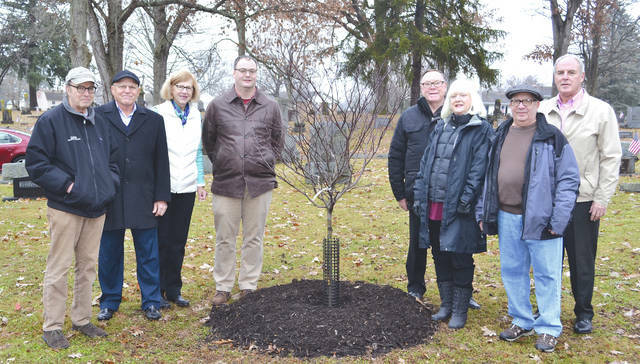 Relatives of Karen Kerns Dresser donated $50,000 to Urbana’s tree planting fund at Oak Dale Cemetery. Ten trees were planted this week. From left are Barry Reich, Mike Birck, Sharon Kerns, Urbana Community Development Manager Doug Crabill, Mayor Bill Bean, Lynn Reich, Marty Reich and city administrator Kerry Brugger. They are standing by a newly-planted Pagoda Dogwood trees on Friday.